"It's an OK handset, but not as slick as the iPhone"
TechRadar's intrepid reporting took it to the T-Mobile flagship store on Oxford Street at 7am this morning. Our mission: to see who would brave the elements to get their hands on the new G1 Android handset before anyone else. The first man in the queue, Richard Lewis Jones, admitted that while he had been standing outside the shops since 5.30, braving the elements, he still might not actually buy the G1. "I came down to check out the G1, though I might not buy it," he said, moments before the rain came down. "It's an OK handset, but it's not as slick as the iPhone. "It's more of a hacker's phone really." 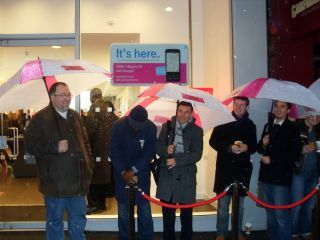 It shows the level of interest in the handset that members of the hack 'n' mod community are willing to stand outside in the freezing cold just to check one out... though to consider not buying one just seems outrageous after all that effort!